We have been very, very, busy the last week. The No Kids team is relocating to Tampa. We’ll keep you all updated on the move. I’m sure we will have plenty to tell you. We moved to Pittsburgh more than 5 years ago and since that cold February, I’ve been meaning to ride on the city’s subway/light rail system known as the T. The official name for the transport system is the Pittsburgh Light Rail, which covers a total of 26.2 miles. 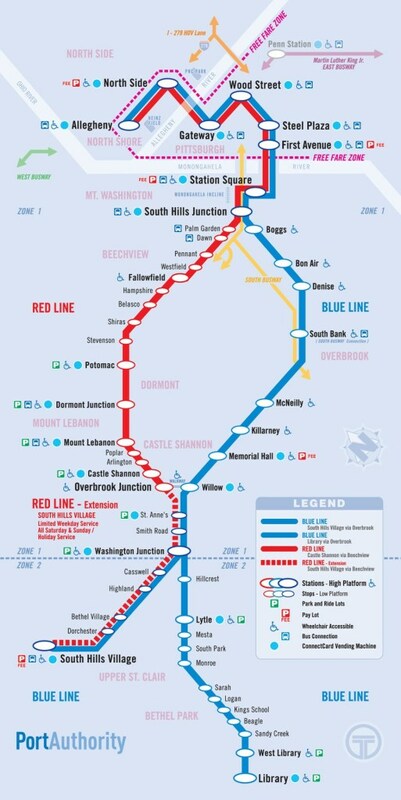 The T doesn’t cover that wide of an area compared to some of the other metro systems we know. It traces a mainly north-south route with one terminus just north of the Central Business District and two termini in the South Hills. The system has one perk: if you are traveling exclusively in the downtown corridor your ride is free. If you live in the South Hills and need to commute into the downtown area on a regular basis the T might be a good way to get into town. We, on the other hand, have tried it on a few occasions and just haven’t found it a useful method of transportation. We’re close enough to the downtown area that it’s faster if we skip the T and walk. A report from Airbnb says that St. Thomas in the U.S. Virgin Islands is trending for spring travel among Airbnb guests. The home-sharing service compared spring bookings from this year to last year to determine the destinations that have increased in popularity. 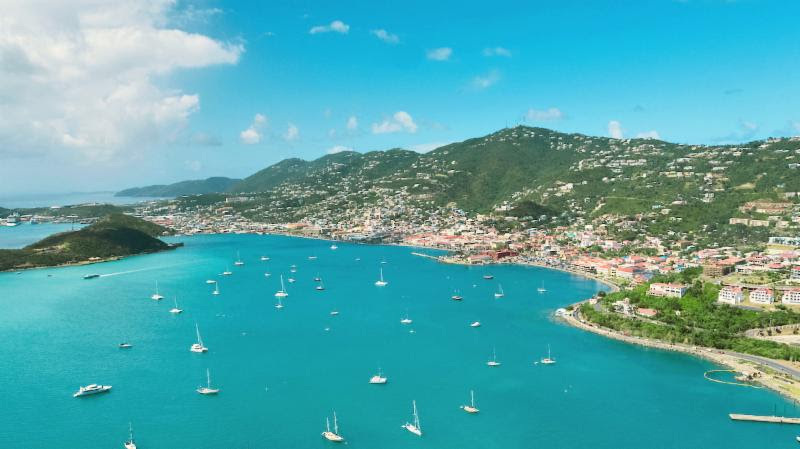 The USVI’s St. Thomas took the sixth spot with a growth rate of 338 percent. The news from Airbnb is part of a trend that was seen from last year when the travel booking site KAYAK said that St. Thomas was one of its most searched destinations for New Year’s Eve 2018. The finding also noted what we who love the Caribbean have been hoping for, travelers continue to book trips to Caribbean destinations still recovering from the impact of the 2017 hurricane season. *Airbnb defines “spring” as the booking period between March 1 and April 21. We are so happy to see people returning to the lovely U.S. and British Virgin Islands year after year. The 2017 hurricanes did a lot of damage; many areas are still recovering and will be for years to come. The money tourism brings in is needed even more now than it was in the years before the destruction. So whether you stay at an Airbnb or a hotel or on a boat, continue to visit and love and support the Virgin Islands as we do. We made a trip home last week for a little ceremony. The 40′ Morgan Ketch that has been sitting in my parents’ pasture 90 miles from open water was finally given a name. 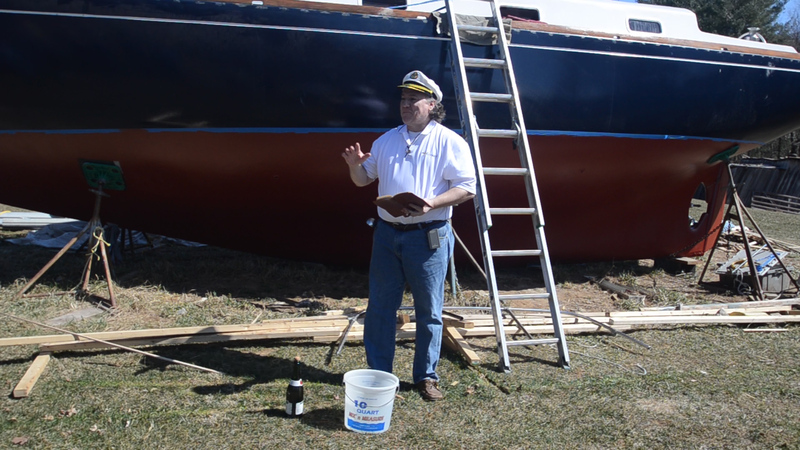 The boat has been undergoing a complete refit at the hands of my brother-in-law and co-owner of the boat. We decided to hold the renaming ceremony before the project because Andi is home from St. Thomas on spring break. I had the honor of being the master of ceremonies, which involved me figuring out what the ceremony entailed. I was able to cobble together a nice little event that had the air of tradition without being overly serious. We gathered with our family and friends in front of the boat. We first called out to the powers that be, asking that the old name of the boat be struck from the ledgers of the sea. With Amanda, Andi, Matt, and I wearing our crew polos, we asked for the blessings of the god Poseidon. I sprinkled champagne in the air for the gods of the winds and into a bucket of salted water for Poseidon. We then announced the name of the boat would, from that moment, be known in the gods’ ledger as the S/V (sailing vessel) Errant. I know we’ve mentioned before that the dingy is getting the name Comma. Yes, that makes the pair the Errant and Comma, or Errant Comma. Matt’s work has been absolutely amazing and he was beaming as he took friends and family on board to look at all the work he’s done over the last 18 months. I’ll make sure to post a link when he has a tour of the Errant on their YouTube channel. You’ll have to deal with me, in the captain’s cap, conducting the ceremony for now. The idea of a luxury cruise typically brings to mind thoughts of sun-filled decks, butler service by the pool, and lavish staterooms as you sail to tropical destinations. Seabourn cruise line wants you to rethink that model, or at least the destination. The luxury cruise line has just unveiled the first purpose-built ultra-luxury expedition ship. An expedition ship is a vessel that has been designed to reach remote destinations and has the hardware and technology necessary to operate in more extreme environments and travel farther than your standard cruise ship that travels the Caribbean or Mediterranean. The hull, for example, will be constructed to Polar Class Standards, making it capable for summer and fall trips to Antarctica, the Arctic, and other extreme climates. The ship’s propulsion system is advanced with Azipods (electric-podded azimuth thrusters), or in layman’s terms, the entire propeller and engine turn — not just a rudder at the stern of the boat. A complement of three bow thrusters gives these ships unmatched maneuverability for vessels their size. A series of shell doors built into the hull along the waterline will provide entrance and egress from the zodiac boats used to move guests quickly to view wildlife and take them ashore to see breathtaking landscapes and have remarkable experiences. The 29,600 square feet of open deck space make for a great viewing platform for scenery and stretching your legs. We think one of the coolest parts is that two submarines carried onboard will be providing an unforgettable view of the world beneath the ocean’s surface. You won’t have to worry about roughing it on these rugged vessels, either. Seabourn claims it is the pinnacle of ultra-luxury travel with intimate ships offering key elements that set the line apart: spacious, thoughtfully appointed suites, many with verandas and all 100% ocean front; superb dining in a choice of venues; complimentary premium spirits and fine wines available on board at all times; award-winning service and a relaxed, sociable atmosphere that makes guests feel right at home on board. The new ships will feature 132 luxurious oceanfront veranda suites, which will be home for up to 264 guests. The first ship is currently planned to sail in the Arctic in late summer 2021, with a full summer season in Antarctica to follow. The crew will include an outstanding and well-traveled 26-person expedition team comprised of experienced wilderness experts, scientists, historians, and naturalists. We aren’t sure if this is what we had in mind when we first started dreaming about trips to the polar regions but we’d love to sign up for a trip someday. A long-awaited new option for Aloha will be reality starting March 17. Southwest Airlines will be starting a new route from Oakland International Airport in Oakland, California to Daniel K. Inouye International in Honolulu, Hawaii. The second flight of the Southwest route will be from Oakland to Kahului Airport on Maui. The carrier will add more ways to get to the islands in the following weeks by adding service from Norman Mineta San Jose International Airport to Honolulu in the beginning of May and Kahului at the end of May. Southwest won’t only be operating service from the mainland to the islands, the budget carrier will also provide interisland service between Honolulu and Kahului four times each day. The interisland service will make it easier to make a Southwest connection from the mainland to island to island. Additional service is planned from San Diego and Sacramento to the Hawaiian Islands in the following months. “As we answer the call for Southwest in Hawaii with an initial schedule of service that speaks to a long-held hope of our customers, I applaud and congratulate our people for their steady and impressive work to bring our world-famous hospitality and game-changing value to the islands,” said Gary Kelly, Southwest Airlines’ Chairman & Chief Executive Officer. With this low-fare behemoth getting into the south seas market, we’re wondering if overall fares will drop due to increased competition. I guess we’ll just have to wait and see if the other carriers follow suit to match the new competitor’s budget fares. The U.S. Department of State has revised its travel advisory for the Bahamas. The U.S. government is telling tourists to take “increased caution” due to rising crime rates. The official State Department Advisory shows that the country is listed at Level Two on the four-step scale. Department of State officials are warning travelers about the potential for violent crime. “Violent crime, such as burglaries, armed robberies, and sexual assault is common, even during the day and in tourist areas. Although the family islands are not crime-free, the vast majority of crime occurs on New Providence and Grand Bahama islands” according to the U.S. Department of State. The warning extends so far as to ban U.S. government officials from visiting the Sand Trap or Fish Fry area of shops and restaurants that are in walking distance of downtown Nassau. It’s unfortunate, particularly because that row of restaurants was where we had one of our best meals during our visit to Nassau. If you’re planning a visit to the Bahamas, you should avoid Over the Hill and the Fish Fry at Arawak Cay in Nassau, especially at night. State also warns you to practice caution when renting watercraft such as jet-skis due to frequent poor maintenance and little regulation. The warning also mentions that several sexual assaults have been tied to these vendors. U.S. government officials are not allowed to use jet-ski rentals on New Providence and Paradise Islands. The Bahamian Ministry of Foreign Affairs released a statement related to the warning on watercraft rentals, which indicates the local ministries of tourism, aviation, and transport are working to make changes in regulation and enforcement to ensure the companies are operating in a safe and responsible manner. The Ministry of Foreign affairs also refutes the idea that crime is a major problem for locals and tourists. “The reality is that the vast majority of the six million visitors who come to the Bahamas – by air, sea, and cruises – vacation in our islands without any incident whatsoever, but, notwithstanding, the Bahamas takes the safety of residents and visitors very seriously and will continue to work in keeping the safety and security of all visitors to our shores priority. We only have pleasant memories of our stays on Nassau. We didn’t even stay in a resort bubble. We stayed in downtown and walked everywhere, including Fish Fry, and even visited the local liquor store. The conditions certainly could have changed, but it’s hard to imagine. Even so, the tips from State are common sense. You should always be aware of your surroundings, it is easier to give up your money than fight, and you should never let strangers into your hotel room. A little extra caution is probably all you need to enjoy your trip, even under an official advisory.